"Is Squarespace bad for SEO?" For whatever reason, a myth has been perpetuated that Squarespace is bad for SEO. Title Tags are easily editable in Squarespace. They're located in the Settings section of each page. I'll tell you right now, there is nothing about Squarespace that makes it bad for SEO. 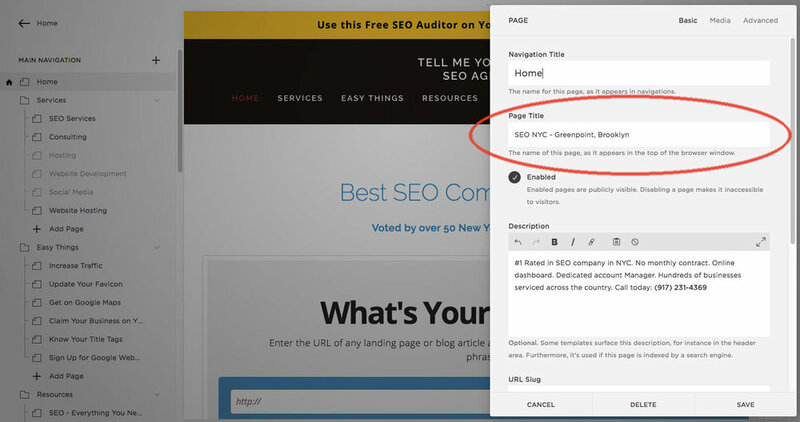 In Squarespace, you have the option to edit Title Tags, Description Tags, H1 Tags, Image Alt Tags, and, of course, the actual body copy of the pages or blog posts. I might actually argue that WordPress is actually more difficult to edit these SEO elements. With WordPress, you're forced to install and update plugins. Plugins? Who has time for that! With Squarespace, all of the core SEO elements are baked right into the Content Management System (CMS). Let's take a look at how to edit a Title Tag in Squarespace. It's super simple. But first, let's understand exactly what a Title Tag is, where it appears, and why it's important. Here's an example of a Title Tag on my website. The Title Tag is the big blue or purple (if you've clicked on it) text that appears on the search results page. Title Tags also appear in another place besides the Search Engine Results page: in the browser tab. Title Tags also appear in the browser bar. You can see what your Title Tag is for each page by hovering over the browser tab. If you want to learn about how to write an effective Title Tag, you can learn about the best practices of editing Title Tags here. Squarespace allows you to edit your Title Tags. It's very easy. Navigate to the page you want to edit the Title Tag for and click the "Settings" icon for that page. You'll see a pop-up window and a section called "Title". That's how you edit it. It's that easy. Of course, you need to conduct keyword analysis before you just start editing your Title Tags. But once you know what you want to write, editing them is easy in SquareSpace. As a best practice, after making any significant changes on your site--SEO edits definitely count as significant changes--you'll want to have Google recrawl your site. You can learn how to do that in Google Webmaster Tools here. Need help building your website in Squarespace?